Q4OS Linux 2.7 Live CD (32-Bit) | Linux DVD Shop - UK Linux Shop supplying Linux on CD, DVD and USB with Free UK Delivery, 24Hr Dispatch. Q4OS for 32-bit computers is a Debian based Linux operating system aimed at new Linux users and previous Windows 7/10 users. It is a fast and powerful operating system that can be run live or fully installed and is based on the latest technologies while offering highly productive desktop environment. Its lightweight design allows it to run on nearly any hardware configuration and comes with a Windows XP look and feel. With a strong focus on security, reliability, long-term stability with a conservative integration of verified new features. Q4OS is distinguished by speed and very low hardware requirements, runs great on brand new machines as well as legacy computers. Running the Trinity Desktop Environment, forked from the KDE desktop, Q4OS also brings you the option of running other desktop environments very easily. Just type in a command, reboot and your new desktop awaits in one of LXQT, XFCE4, Cinnamon, KDE Plasma and MATE. Software includes Google Chrome alongside the Q4OS Software Centre for easy one-click installs of Firefox, LibreOffice, VLC Media Player, Thunderbird, Wine, GParted and easy Nvidia and multimedia code support with access to thousands of packages via Debian using Synaptic package manager. 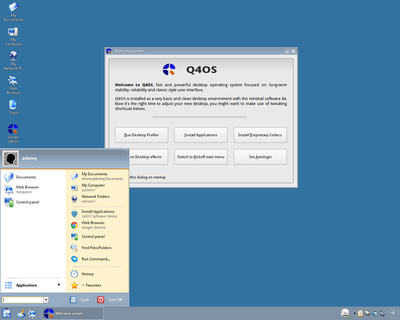 Q4OS is a unique and innovative OS and only needs minimum requirements of Pentium 300MHz CPU with 128MB RAM and 3GB hard disk space.